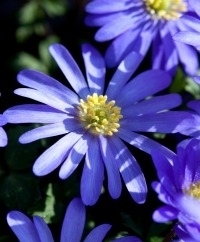 Native to Greece circa 1898, Anemone blanda yields happy little daisy-like flowers with yellow centers on wiry stems above fern-like foliage. 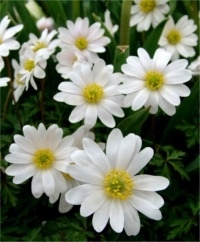 Commonly known as Grecian Windflowers, they are available in blue, pink, white or in a mixture of the three. 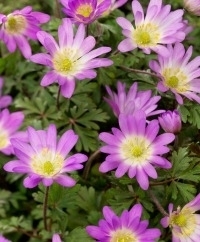 Anemone blanda prefers to be planted in organically rich, well-draining soil in full to partial sunlight. 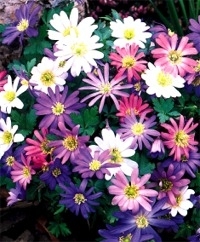 Deer- and rodent-resistant, Anemone blanda makes an attractive 4" to 5" ground cover in border plantings or as an underplanting beneath contrasting Hyacinths, Tulips or Narcissi. Anemone blanda are also lovely mixed with select varieties of Muscari and other special, miscellaneous bulbs in naturalizing drifts. The bulbs are actually corms that look like black, irregularly-shaped, wizened little pellets. If the soil is dry at planting time, you can give them a head start by soaking them no longer than eight hours in room temperature water. It’s terrific in garden borders, sunny woodland borders and in irregular river-like swaths. You’ll need about nine bulbs per square foot. Bulb size: 5 cm/up. Full to partial sunlight. Bloom time in horticultural zone 5: April/May. Plant 4" deep and 3" to 4" apart. HZ: 5-9. Height: 4".